Disrupt formed in the summer of 1987 in Lynn, Massachusetts. The lineup was Jay Stiles-vocals, Pete Kamarinos-vocals, Chris Drake- guitar, Harry Haralabatos-drums, Tony Leone-bass. After recording one rehearsal demo, Tony and Harry left the band. Brad Clark- drums and Mike Williams-guitar joined in the spring of 1988. Brad left the band a couple of months later and Mike started playing drums. With this lineup, they recorded the Millions Die For Moneymaking- 13 song demo with Jay also playing bass in Nov. 1988. In the spring of 1989, Mike and Chris left the band. Harry our first drummer rejoined the band so we could record songs that at the time were supposed to be on a split 7" with ENT. Scott Lucid-bass joined the band at this time. 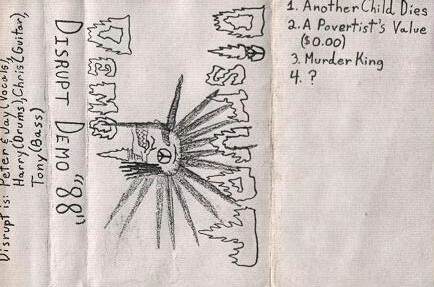 In Oct. 1989, we recorded 5 songs for the s/t 7" that was co-released on Crust records and Deafcore records. Pretty much a home demo recording. Recorded on a regular non studio tapes.